Fair Play Golf Course is an 18 hole Public Golf Course. 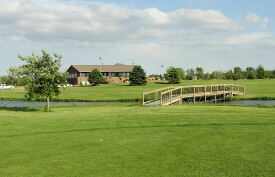 It features a beautiful new clubhouse with a view of almost every hole. The course is relatively flat with rolling mounds and over 450 trees scattered throughout, plus three lakes adding to the beauty of the course as well as making the course more challenging. OPEN TO PUBLIC! From Airport (South of Norfolk) take Old Highway 81 South 2 miles, turn right at sign, ½ mile West. © Copyright 2019 Fair Play Golf Course. All Rights Reserved.